Demonstrator: YUAN GUO JUN is a 7th generation inheritor of Yan Qing Quan. It's not simple but it's not impossible. There is a system of Kung Fu known as Lost Track (Mi Zong). Being Lost Track it would only make sense it has other names. One of these names is Yan Qing, supposedly after its creator a monk named Jin Nan Luo with religious name of Yan Qing. If you look at our information box on this subject we don't say it will be clear but as clear as anyone cane make the explanation of a style known as Lost Track. Much more importantly, we feel we have something in Yuan Guo Jun. He stands out as one of the upper ranks of the hundreds of practitioners (thousands counting tournaments and decades of teaching). We're not saying he's the best. We're saying look below and consider some real, rural, heart felt Kung Fu from the Tang Mountain branch of Yan Qing. A long and very expressive form that is almost a one form survey of the Yan Qing. There is some influence, to our eyes, of Contemporary WuShu, but the structure and the movements of this form will take you through a rather beautiful set of Yan Qing (Lost Track) movements. Yan Qing is a popular and widely diversified Northern style and this form combines a number of branches into an fast, smooth and highly changeable representative form. This one had a large range of Yan Qing movements with direction changes and Long Fist attacks. This is a powerful form that appears well steeped in the traditional arts. 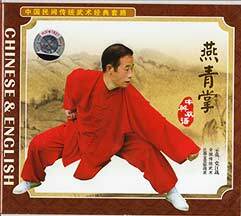 Strong movements, characteristic Yan Qing postures, low kicks as well as high. This is a long set but also a substantial one that is purported to be well known in the Lost Track arsenal. Certainly a candidate if you want strong forms out of this style. 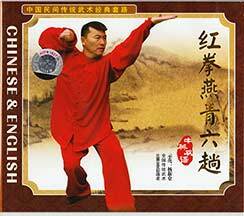 Yang Xin Cang himself is a Gold Medal winner in Traditional martial competition. An excellent performance with an unusual weapon. Most steel whips, even in Northern Style, are seven, nine or eleven sections. This 13 section instrument allows for some additional movements not generally displayed such as center twirling the weapon balanced on one finger. The instructor is very familiar with the instrument showing a number of flicks, wraps and twirls hardly every seen. This is a dangerous set to try and learn if you aren't familiar with soft weapons. Be warned. Now this is a sword set! Infused with Yan Qing's "dark and light" actions it shows a series of well mastered and interesting as well as beautiful actions. It is a long handled sword so, while performed mostly single handedly, almost all the applications use two handed actions. A beautiful series of movements done with great expertise and originality. One of Yuan's outstanding traits is the "organic" look of his style. As George Xu has said, it there is no "animal" quality you don't have Kung Fu. Every weapon in the Kung Fu arsenal is based on specific and universally accepted actions. In the case of saber for instance there is split, hang, rub etc. But a real style, an organic style shows specific differences even in the most basic actions completely unlike modern, urbanized Kung Fu. All that is not to mention that the special surprise of this weapon is that it is change almost constantly in the set from the right hand to the left. That's not to mention that there are reversal cuts, shelved positions and a number of very unusual actions. Applications are shown with some real energy and fierceness. Some of the few we see with even a semblance of practical, ancient usage. A medium length hand form with emphasis on short and long power considered one of the "hidden" forms of the system. Many hand fans, off angle strikes and turns. Yuan Shihfu has a wonderful combination of animal energy and controlled smoothness. His over all body art is high showing the kind of Kung Fu we rarely seen nowadays. He is a fighter and his applications shown on each disk are direct, powerful and flexible. He never does the same thing twice. Definitely the kind of style and shapes that should be studied and imitated by aspiring Kung Fu artists. Another excellent and interesting form known as the 3rd in sequence. Movements are alternately open and close with much of Yan Qing's unusual rhythm and mutability. Yuan's movements are deeply personal, refined not only to show a high level of flexibility and power but also distinctive angles and approaches. His is the kind of Kung Fu we associate with villages and rural practice which, contrary to what one may think, has preserved much of the best of Kung Fu's skills throughout the centuries. Three Step Form. This form is considered the fundamental one of this branch. Its purpose in the Yan Qing system, is to clearly differentiate between hard and soft and this form does an excellent job. Within the first ten movements there is a noteable section where soft and relaxed energy literally erupts into powerful strikes. Again, we have the unique stepping, twisting and posing of the Yan Qing style. None of the forms of this series could possibly be described as "easy" but this short form gives quite a feeling for the style. Mobile, soft, deceptive and changeable: this describes the Yan Qing staff. The actions per particular emphasis on the flipping of the hands back and forth. Good strong and big moves alternate with little shots from underneath, or wrist changes and light handed attacks. A very good staff set of at least intermediate level. It lives up to the unpredictable nature of the style. The applications follow classic technique with the stick, good footwork and very little wasted motion. A short set done with the casual style of someone familiar with the weapon. Though very good we don't see Shihfu Yuan's spear as high a performance as his other weapons. But when he demonstrates usage he is knowledgeable and accurate showing the kind of movement which has almost been forgotten. His spear is good, don't misunderstand us, just such a short set that his other stellar performances overshine it a bit. Dui Shou. The saying for this style is "One hand lies, and one hand tells the truth." This should be evident in application also. And here we have strong applications by a demonstrator who's "got it." His movements show a confidence and directness that only comes from dodging full speed punches. The applications are traditional but also contain that little bit of veracity that makes the possible into the doable. Every application is strong and involves some type of reversal of energy and collision. Good strong work. Based on the fifth form in sequence. The flagship form of the system. A major form with strength, flow and character. A compendium of techniques that is almost "lost" in that the movements are fare less repetitious and range more than most forms. Good postures, timing and excellent representations of power. A sophisticated and interesting form. If you are interested in the style worth a try. Some applications are shown. A shorter form than Yan Qing but probably of equal sophistication. Said to be the second in series, it is also a bit "softer" than the other form. It has a distinctive section of spinning and turning where the practitioner slaps himself in numerous places around his body. The movements have some "s" curve footwork that is very spry and unexpected. Applications shown for some movements.